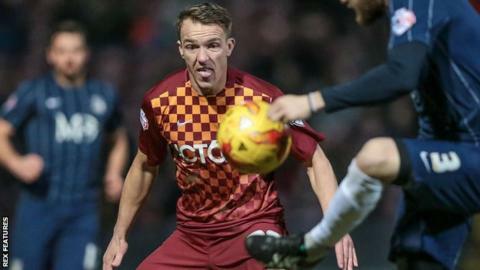 Bradford City eased to their third victory in four games as they beat Southend United at Valley Parade. Tony McMahon's curling free-kick beat keeper Daniel Bentley to give Bradford the lead after an aggressive start. Wes Thomas came close to a second as he cut inside to pick up Josh Cullen's pass but chipped his shot over the bar. Stephen McLaughlin shot over the bar for Southend after the break, but James Hanson's header deflected in off Bentley to secure victory for Bradford. Match ends, Bradford City 2, Southend United 0. Second Half ends, Bradford City 2, Southend United 0. Corner, Southend United. Conceded by Stephen Darby. Substitution, Bradford City. Billy Knott replaces Tony McMahon. Attempt missed. Lee Evans (Bradford City) right footed shot from the left side of the box misses to the right. Attempt saved. Anthony Wordsworth (Southend United) right footed shot from outside the box is saved in the top centre of the goal. Attempt missed. Kyel Reid (Bradford City) right footed shot from outside the box misses to the right. Attempt saved. Steve Davies (Bradford City) right footed shot from the left side of the box is saved in the centre of the goal. Kyel Reid (Bradford City) wins a free kick in the defensive half. Corner, Bradford City. Conceded by Cian Bolger. Attempt blocked. Lee Evans (Bradford City) right footed shot from outside the box is blocked. Attempt blocked. Reece Burke (Bradford City) right footed shot from outside the box is blocked. Goal! Bradford City 2, Southend United 0. James Hanson (Bradford City) header from the centre of the box to the high centre of the goal following a corner. Corner, Bradford City. Conceded by Michael Timlin. Substitution, Southend United. David Worrall replaces Will Atkinson. Corner, Bradford City. Conceded by Daniel Bentley. Attempt saved. Tony McMahon (Bradford City) right footed shot from the right side of the box is saved in the bottom left corner. Michael Timlin (Southend United) is shown the yellow card for a bad foul. Substitution, Southend United. Jamar Loza replaces Gary Deegan. Stephen Darby (Bradford City) is shown the yellow card.